Summer ended a few weeks ago, but here in California it's still hot and sunny. 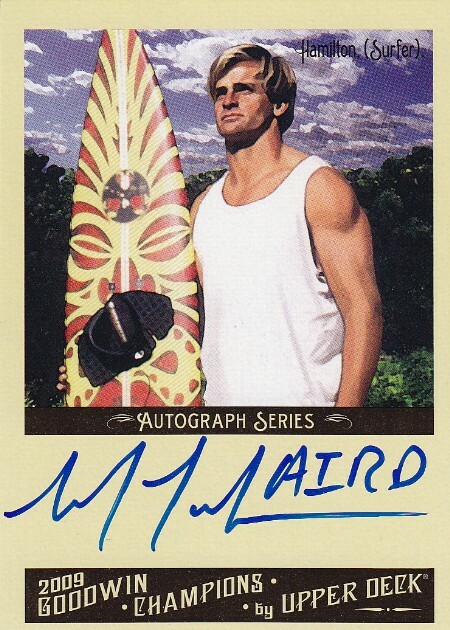 So I figured... let's ride out this heat wave together with pieces of cardboards featuring surfers with boards. But before I do, it's important that I start this on the correct note: I'm a poser! I have never ridden a surfboard in my life. But... 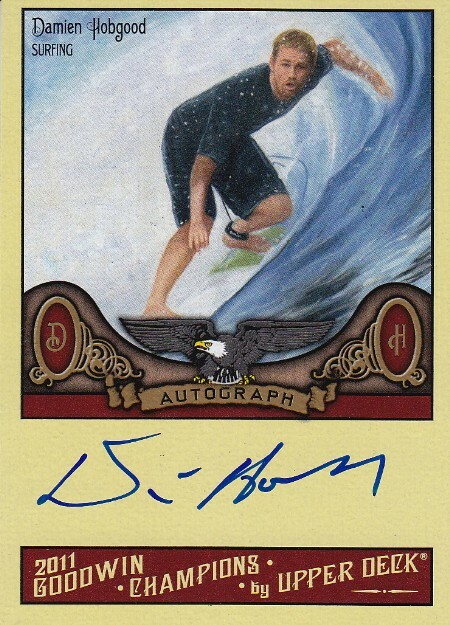 I spent most of my childhood summers in Hawaii surrounded by cousins who surfed. I'm not sure if it was "lack of skill" or "fear", but I always ended going boogie boarding or body surfing with the younger cousins. Unfortunately neither of those sports are as glamorous as surfing. Which probably explains why I was so fascinated by the sport in my youth... even though I never tried it. How fascinated you ask? Well... one of the first magazines I ever subscribed to was Surfer. 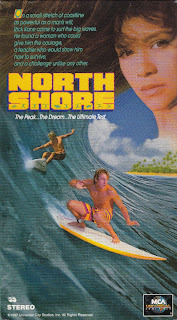 And one of my favorite movies was North Shore, which featured legendary surfers: Gerry Lopez, Mark Occhilupo, Derek Ho, Mark Foo, Laird Hamilton, and Corky Carroll. I remember seeing the Haleiwa Rainbow Bridge in the movie and thinking... that's right down the street from Matsumoto's Shave Ice. It sounds silly... but it was cool to see places I hung out at in scenes from the movie. 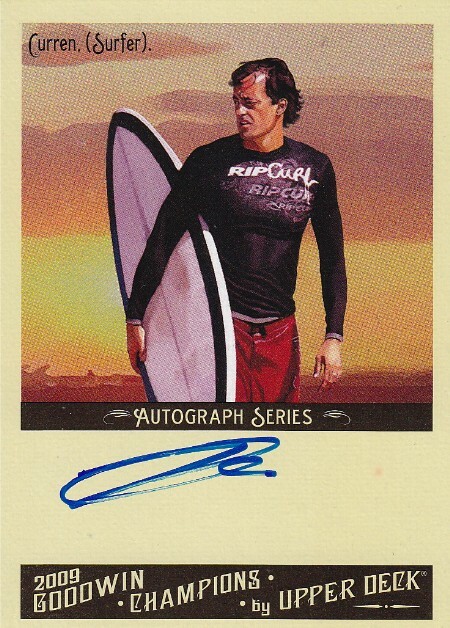 Anyways... that's why I was stoked to see Upper Deck include autographs of surfers in their 2009 and 2011 Goodwin Champions sets. Over the past three years, I've slowly been picking them up here and there. 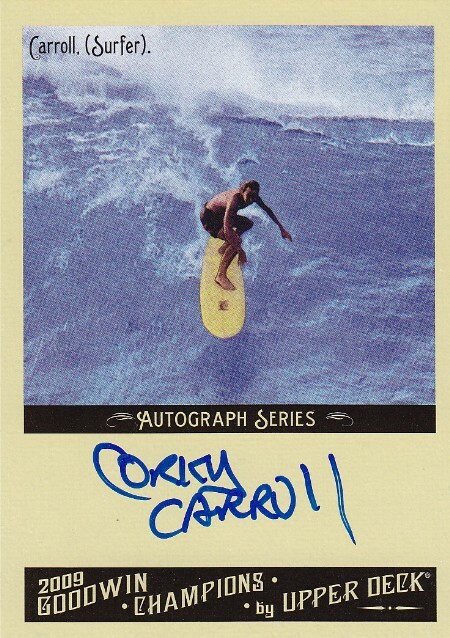 And two weeks ago, I was finally able to obtain the Tom Curren autograph that had alluded me for so long. 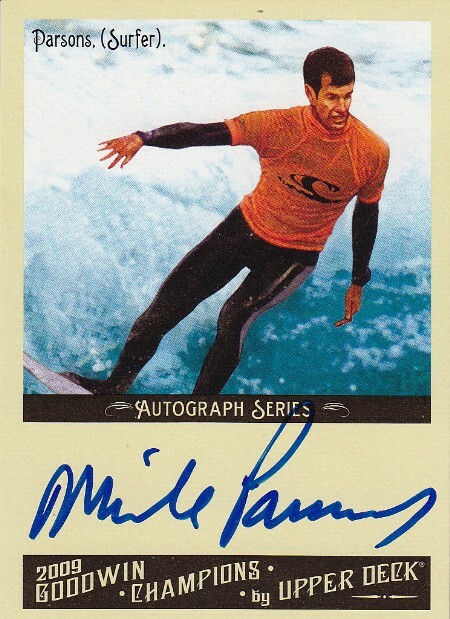 It cost me more than the seven other autographs combined, but I can finally say the Surfer Project is complete. Or is it? 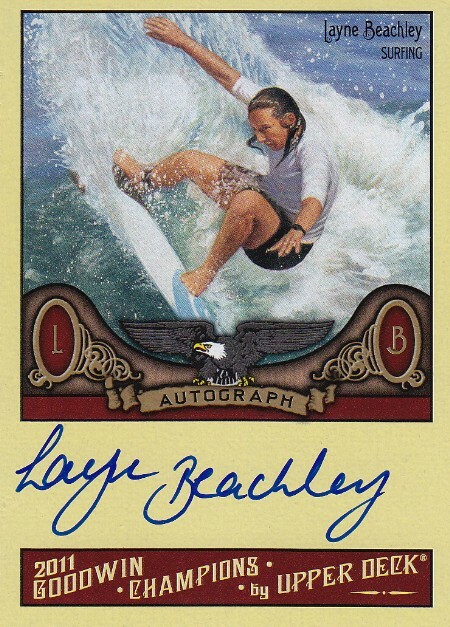 I just discovered that Upper Deck added three more surfers to the 2012 autograph set. Damn them! 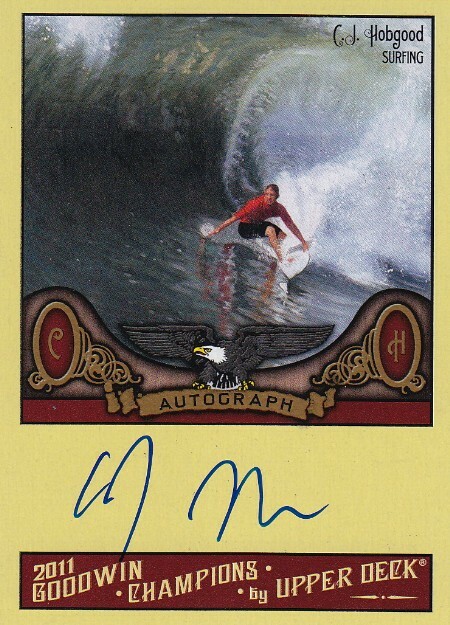 I know he's one of the surfers who signed for the 2012 set, so if anyone out there has his autograph and is interested in trading it... please contact me. How do you feel about UD including autographs of bull riders, hacky sackers, runners, motocross racers, and poker players in their Goodwin Champions set? Love it, hate it, or somewhere in between? Aloha and have a great week!